— Two small rock samples — one from the top of our world and the second returned from another — are ready to launch to the International Space Station as a symbol of NASA's continuing mission to explore. 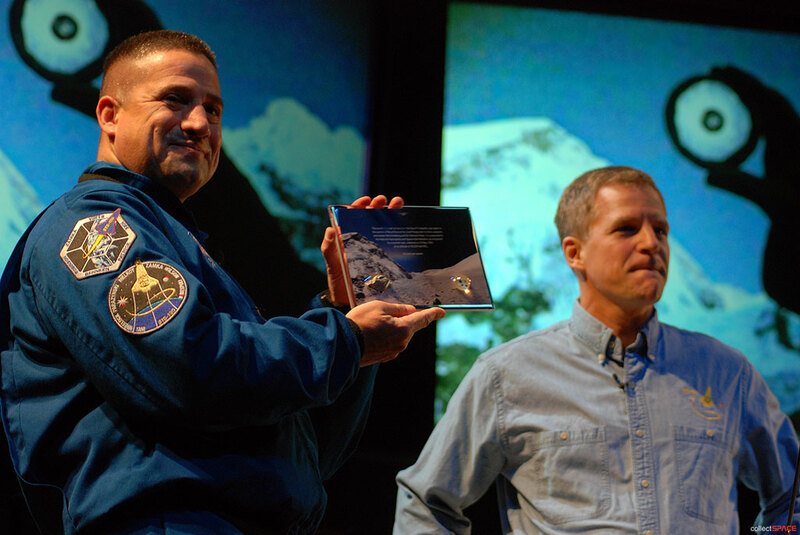 The space-bound stones — a fragment of Mount Everest's summit and four flecks from the moon — were presented Wednesday to George Zamka, the commander of NASA's next space shuttle mission, by the first astronaut to scale the Earth's highest mountain, Scott Parazynski. "These rocks have already done more than a human being could do in a lifetime," said Zamka during the ceremony held at Space Center Houston, the public visitor center for NASA's Johnson Space Center in Texas. "For four billion years they were on the Moon, undisturbed. They went through an ascent on a spaceship traveling to Earth and then Scott took them to the limits of human endurance by climbing up with them on Mount Everest. So they already have a tremendous history. They're about to get a mileage upgrade." "When they go on the space station," he continued, "they are going to travel at 17,500 miles an hour for a number of years. They are going to have a tremendous trip." 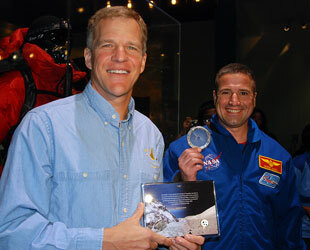 Parazynski personally retrieved the Everest rock when he reached the 29,000-foot mountain's peak on May 20, 2009 while carrying the four fragments of the moon collected by Neil Armstrong and Buzz Aldrin during the first U.S. lunar landing mission 40 years earlier. "These little samples were collected literally worlds apart," Parazynski told collectSPACE.com. "But there are other worlds for us to go explore, and [the space station crews] are going to be a part of it." Zamka, who with his STS-130 crewmates are scheduled to launch to the ISS onboard space shuttle Endeavour on Feb. 7, will install the rock samples inside the Cupola, a window-studded viewing port attached to the new module they are adding to the outpost. Named "Tranquility" for the Apollo 11 site where the lunar crumbs were retrieved, the module will house the station's life support systems. This isn't the first time that fragments of Everest and the Moon have flown to the space station, though it is the first mission on which they have flown together. NASA secretly stowed a 21-gram lunar rock, also brought back to Earth by the Apollo 11 crew, aboard a March 2009 shuttle Discovery mission as part of its 40th anniversary celebration for the first lunar landing. After floating aboard the orbiting outpost for a few months, during which time it starred in a downlinked video from the ISS, the moon rock was brought back to Earth but not before being scheduled for another flight. NASA pledged to fly the rock back to the Moon on its first mission to return humans to the lunar surface, a symbolic gesture that hearkened back to 1972 and the Apollo 16 mission that delivered an Apollo 12-collected rock back to the Moon as part of a science experiment. 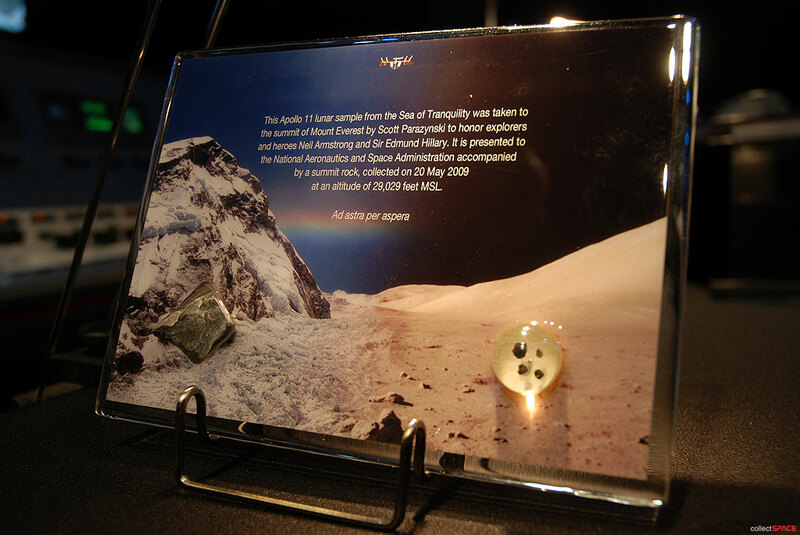 The moon rocks that Parazynski toted up Everest and are next to fly with STS-130 — four small chips that together weigh just 0.05 grams — were originally encased in acrylic for another symbolic mission: a goodwill gift. By order of then-President Richard Nixon, approximately 250 similar button displays were created in late 1969 to be distributed to the U.S. possessions and states as well as 135 foreign nations. The now station-bound set was left over from that original allocation. It was another nation, Canada, that brought the first piece of Everest to the space station. 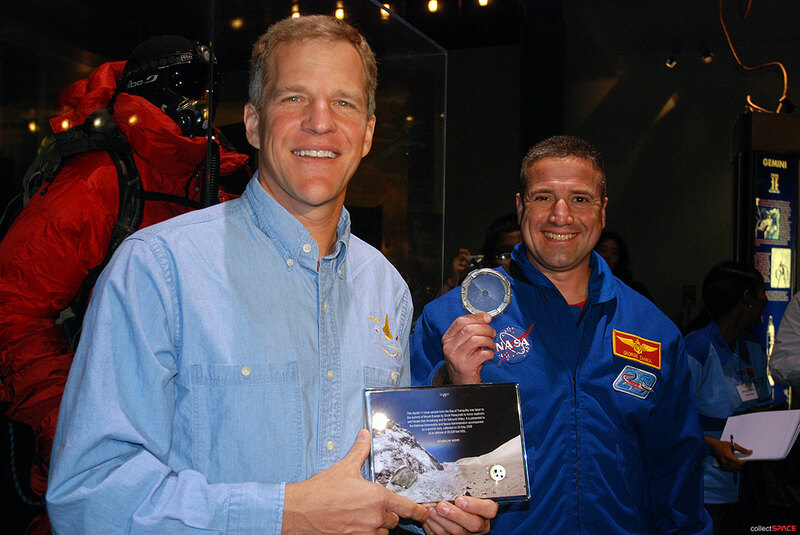 In Sept. 2006, STS-115 mission specialist and Canadian Space Agency astronaut Steven MacLean flew a pebble from 'the top of the world' that had been retrieved by Canadian mountaineer Bernard Voyer in May 1999. 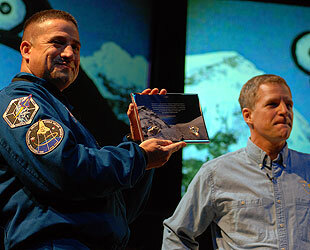 MacLean, who in 2008 became president of the Canadian Space Agency, returned the Everest rock to Voyer in April 2007. At least one other piece of the peak has flown to space. 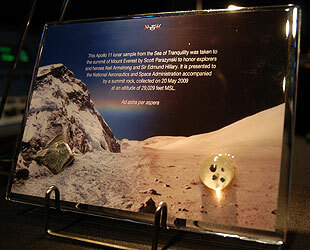 A rock collected in 1963 during the first ascent of the West Ridge of Mount Everest flew with the personal items of mission specialist and medical doctor James Bagian on the 1991 STS-40 Columbia mission. 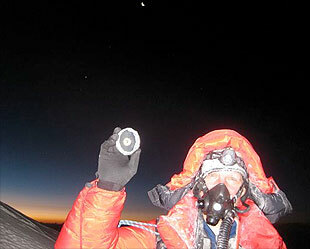 Parazynski, who like Bagian has a medical degree, gave NASA a rock he collected on his second attempt at Mount Everest. His first climb a year earlier in 2008 ended early due to his suffering a back injury. The NASA-prepared plaque to which both the moon rocks and Mount Everest rock were attached for their flight to space includes an inscription dedicating their journey with Parazynski to "honor explorers and heroes Neil Armstrong and Sir Edmund Hillary," the first men respectively to walk on the Moon and summit Everest. "Neil [Armstrong] and Sir Edmund Hillary in particular were huge inspirations to me. I read all about their exploits. One thing that I learned is that they became close friends later in life. They had, in fact, traveled to the South Pole together and stayed in close touch up until Sir Edmund's death not too long ago. So one of the things I wanted to do was honor them," said Parazynski. The rocks' launch to the space station in February is in honor of the men and women who followed — and continue to follow — in both men's footsteps, said Zamka. "They will be there as a reminder to all astronauts up there as to what human beings can do and what our challenges are," he said. "To be in the Cupola looking at these rocks, looking at the Earth, looking at the space station, looking at the Moon, it is just going to let us know how far we've come and how far we have to go," Zamka told collectSPACE.com. The rock-adorned plaque will remain aboard the station for the foreseeable future, as NASA flies its remaining four (after STS-130) scheduled shuttle missions and refocuses its manned exploration efforts to moving beyond low earth orbit. Eventually, a future crew will bring the rocks back to Earth, underscoring the nature of the locations where the stones have been. "People can only visit the Moon, granted we haven't done that for a long time. You can only visit Mount Everest and the same thing with the space station, you can only visit the space station. The rocks will be fixture up there while the people come and go to see them," said Zamka.